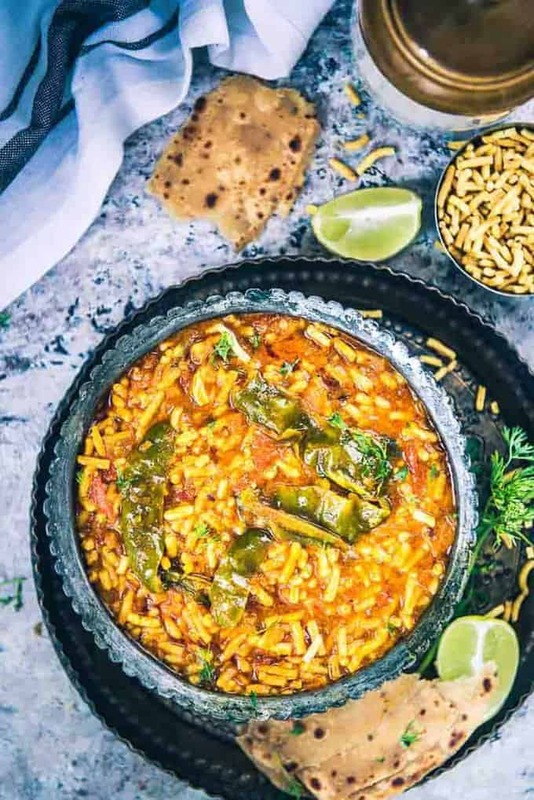 An incredibly humble accompaniment, Rajasthani Sev Tamatar Ki Sabji is made using juicy tomatoes, desi masalas and served with heaps of besan sev. Here is how to make Sev tamatar Ki Sabzi. The lands of Rajasthan are considered royal and rightfully so, because be it their culture, their people, their tradition or as a matter of fact, even their cuisine is indeed mesmerizing. Right from the warm hospitality of Rajasthan which always lives by the line- “Padharo Maahre Desh!” till the generous and rich which is served to you every time you visit this majestic land, Rajasthan never ceases to rule your heart. Having visited Rajasthan on countless occasions, it would be an understatement to say that I have been deeply influenced by its culture, tradition and of course, being a food consultant, even by its exotic cuisine. Some of my all time favourite dishes from this region include Rajasthani Safed Maas, Rajasthani Jaiphali Aloo, Rajasthani Mawa Kachori, Rajasthani Pitori ki Sabzi et al. While the aforesaid are slightly elaborate accompaniments which you could preferably make on weekend with luxury of time, for a quick treat, you may definitely prepare Rajasthani Sev Tamatar Ki Sabji which I recently tried at home! An incredibly humble accompaniment, Rajasthani Sev Tamatar Ki Sabji is made using juicy tomatoes which is sautéed with desi masalas and served with heaps of besan sev. As much as this sev ki sabji is popular in Rajasthan, it is equally liked in Gujarat as well and why not, as it is really fingerlicking and takes no time to get made! 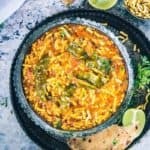 Slurp over the succulent chunks of masala full tomatoes and trip over crunchy sev – oh, you are going to love Rajasthani Sev Tamatar Ki Sabji so much that I simply cannot describe it! Though you could serve Rajasthani Sev Tamatar Ki Sabji with any Indian flatbread, I suggest you must devour it with Bajre ki Roti for a change, because you are surely going to love it without a doubt! Do note down this super easy, authentic Rajasthani accompaniment if are already drooling and make sure to share it with your foodie friends, okay? 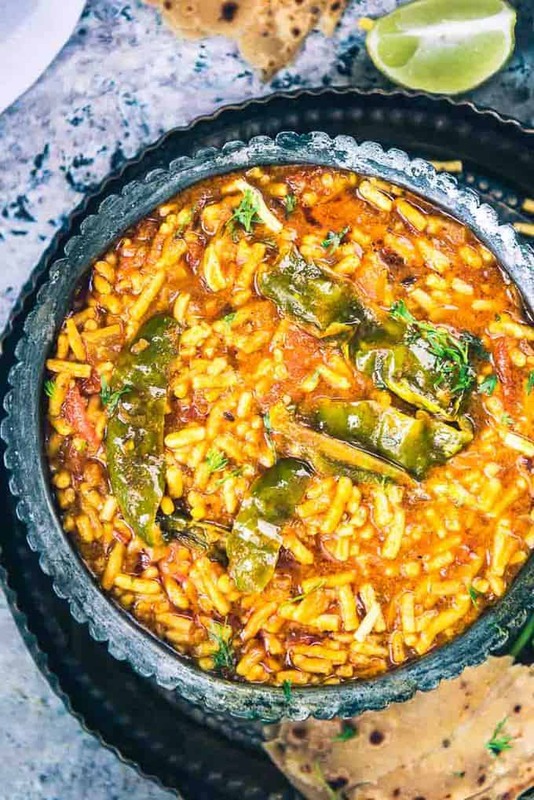 An incredibly humble accompaniment, Rajasthani Sev Tamatar Ki Sabzi is made using juicy tomatoes, desi masalas and served with heaps of besan sev. Once the oil is hot, add cumin seeds and hing and let them crackle for a few seconds. Add green chilli, ginger and garlic and fry for a minute. Now add tomato and cook until it becomes mushy. Add coriander powder, turmeric powder, kashmiri red chilli powder and salt to taste. Add 1/2 cup of water and cook until oil separates from the side. Now add 1 cup of water and bring the sabzi to a boil. Add sev and lemon juice and switch off the heat.